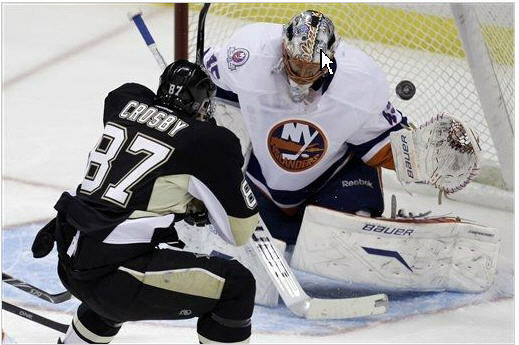 The superstar center capped his return from concussion-like symptoms with two goals and two assists in his season debut as the Pittsburgh Penguins roared by the New York Islanders 5-0 on Monday night. Unleashing more than 10 months of frustration in 16 energetic minutes, Crosby put to rest all the questions that had popped up during his lengthy comeback. Can he still skate? Can he take a hit? Can he play at his nearly peerless level? Can he mix it up? The answer — for the first night anyway — is an emphatic yes. For no one more than Crosby, who celebrated his first goal in 328 days in decidedly un-Crosbylike fashion. After a breathless sprint down the ice in which he weaved through the New York defense and beat rookie Anders Nilsson with a backhand, Crosby raised his arms in triumph and let out a roar punctuated by a hard-to-miss profanity. Crosby added assists on goals by Evgeni Malkin and Brooks Orpik and capped his comeback with a second tally, a backhand that fluttered by Nilsson early in the third period to provide the final margin. Steve Sullivan also scored for the Penguins while Marc-Andre Fleury stopped 29 shots to collect his 21st career shutout, one behind franchise leader Tom Barrasso. The Islanders aren’t a good team and their goaltending is horrible but still Crosby’s performance last night beat any expectations I had for him in his first game. 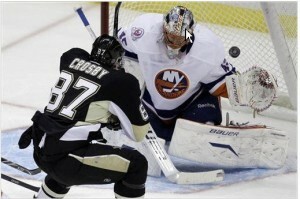 Pittsburgh had 25 points and was leading the Eastern Conference without Crosby. With him back in strength, the Penguins just became a whole lot scarier.